Cocoa butter is that interesting product of the Cacao Tree that never gets as much fame as its yummy, highly praised, chocolate cousin. In 1735, Carolus Linnaeus (also known as Carl), a Swedish naturalist and explorer, officially named the Cacao tree Theobroma Cacao which roughly translated is “foods of the gods.” How appropriate is that? I mean, very few people I know of would disagree with Carl on that one. He was a chocolate lover, so he knew exactly what he was talking about. Why is cocoa butter so interesting? First off, everything has to be right for this tree. Not too much sun, wind, or rain. It lives in hot, rainy tropical forests and uses taller trees to shelter them from the above stated annoyances of life. If this tree were human, I think it would resemble a person at the beach covered in sunblock, wearing an encompassing hat, and huddled under an umbrella. These trees are susceptible to a number of diseases because of the warm, moist climate they live in. Bugs stress them out so much that they can die from it. Can you hardly blame them about that though? I know when I see a spider running across the floor I’m immediately stressed in more ways than one. Of course from the Cacao tree comes chocolate, but when cocoa beans are fermented, roasted and separated from their hulls, over half of the residue is cocoa butter. In its raw state, this extracted cacao seed fat is a cream color. So, what does cocoa butter have that makes it good for you? Calcium: Which is essential for building strong bones. Calcium also helps our blood to clot, nerves to send messages, and even muscles to contract. Potassium: It regulates water and the mineral balance in your body. Magnesium: It helps to regulate muscle and nerve function. Not only that, it also helps to do the same with blood sugar levels and blood pressure. Zinc: It’s needed to make proteins and DNA, not to mention it’s very helpful in fighting off bacteria and viruses. Manganese: Is used for weak bones. Copper: Which is a very fun, interesting mineral that’s essential in building strong tissue. It is marked as one of the world’s healthiest foods. Check it out! Not only is cocoa butter filled with minerals, it contains vitamins such as A, which helps skin in repairing itself and staying moist. It also has vitamin C, which helps to protect cells from damage by free radicals. Cocoa butter acts as a barrier to prevent moisture loss and to keep skin soft. It melts when it touches skin since its melting point is just below body temperature, making it easy to put on. It is also used in treating stretch marks, eczema, and restoring pH balance to your skin. If you’re crafty and enjoy working on projects, you can even make your own cocoa butter lotion! Check out this blog post on how to do just that by Amber from The Tasty Alternative! Cocoa butter can help repair damage done to your hair from colorings, perms, and even other styling aids. If your hair seems to have lost its shiny, sleek, healthy look, giving it cocoa butter could be just what it needs. You can use cocoa butter as a pre-wash treatment or conditioner. Easy instructions on how to do either of these can be found here! If you’re feeling like you really want to pamper yourself, you can even add some raw cocoa butter to your bath. It melts quickly and helps to moisturize your skin while you relax. Be careful stepping out, though. It might be slippery! What kind of cocoa butter should I use? 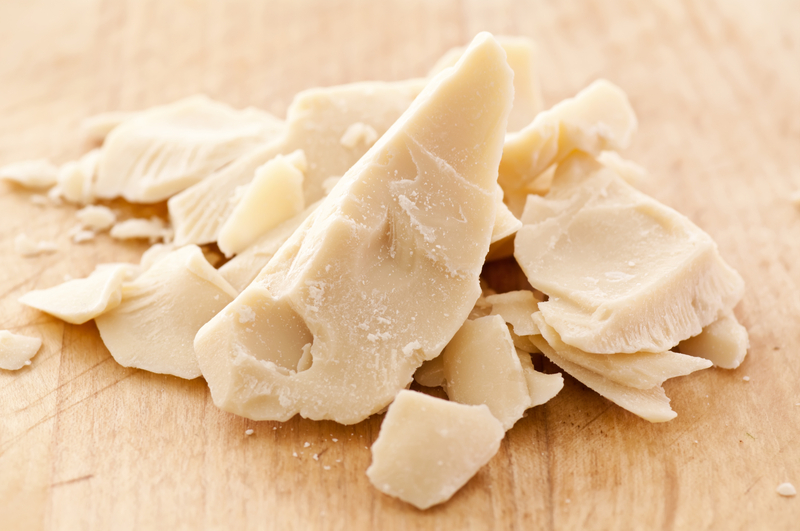 When using cocoa butter, it’s better to go for the raw kind. If you use lotions that say they have cocoa butter, you have to contend with added chemicals. Since your skin readily absorbs things, it’s best to make certain what you put on it is safe for your insides also. Have you ever used cocoa butter before? Leave a comment below! Stay updated on all our posts by subscribing through email or following us on Facebook!